Based on Calypto’s patented Sequential Analysis Technology, PowerPro CG reduces power by up to 60% with little or no impact to timing or area. PowerPro CG reads in an RTL design and evaluates circuit behavior across multiple clock cycles to identify sequential clock gating enable conditions. PowerPro CG then generates new low-power RTL that looks identical to the original RTL with the addition of sequential clock gating logic. The new PowerPro CG generated RTL is comprehensively verified with Calypto’s SLEC Pro. 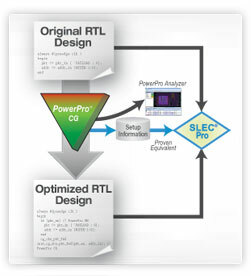 SLEC Pro is a Sequential Logic Equivalence Checking tool that guarantees functional equivalence between the PowerPro CG generated RTL and the original RTL. No other solution provides this combination of automatic RTL power optimization and formal verification. PowerPro Analyzer is a powerful graphical visualization tool that provides a complete view of the PowerPro CG optimized design. PowerPro Analyzer allows users to view power optimizations in the context of RTL source code, schematic display, and design hierarchy. All design views are hyperlinked for rapid navigation and analysis of the sequential clock gating logic inserted by PowerPro CG. This enables designers to have a detailed understanding of the optimizations PowerPro CG is performing. PowerPro CG consistently produces better results in significantly less time than manual clock gating. PowerPro CG saves more power than traditional combinational clock gating tools by turning off a larger number of registers for longer durations. The results from PowerPro CG are complimentary and cumulative to low-power RTL synthesis tools.